MySiteMalixi provides Simple and Cost Effective Way of managing our client’s online presence. Most people think that they know what they like, but after you've worked with more than a couple of clients you will realize that most of them have no idea. They think they know what they want, but in reality they often have very little clue on what is going on. For those who have experience in having a website or managing a development, they are mostly the ones who have a concept of what they like making it easy for the developer to create a much better concept basing on their existing ideas. Oftentimes, when working with a client, we start out with a "Definition of the Development Project" by business industry concept and insights on their existing operations. Images, Custom Logo Design, Web Design and Copywriting Services are done according to the client’s needs and content availability. Putting it all on a contract after making the project estimate basing in what we agreed. 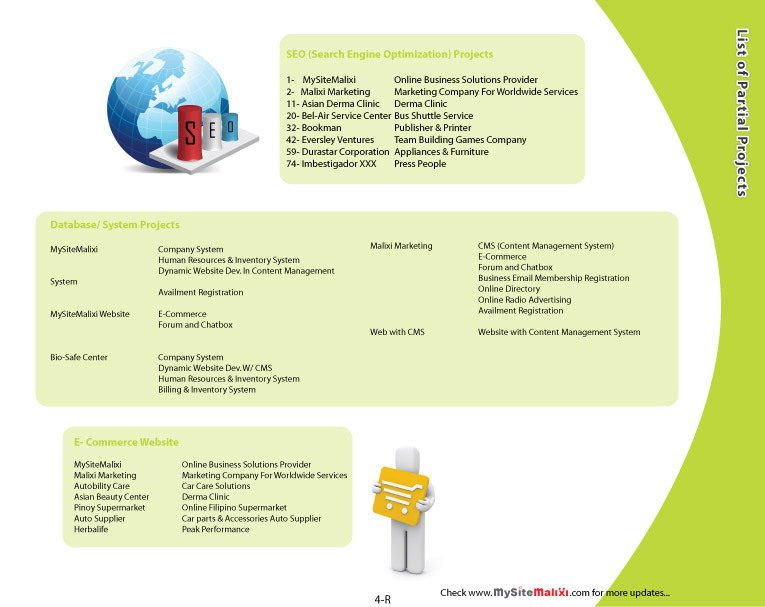 MySiteMalixi provides innovative solutions for all types of businesses & organizations of different sizes worldwide. We invite you to see our partial projects below. Control Your Weight Products Weight Loss Challenge Getting Started Bookman Inc.